And officials are not overly concerned, even as destructive winds, drenching rains and a swamping storm surge approach. Swan Quarter, NC (Greenville News) - The wild horses of Ocracoke Island were tough enough to survive the abandonment or shipwrecks of explorers in the 16th century, according to the research of the National Park Service. They're going to have to be tough enough to survive Hurricane Florence. The descendants of Spanish mustangs, commonly called Banker horses for the chain of barrier islands where they live, have galloped around the shifting dunes on the Outer Banks for hundreds of years. Ocracoke has 15 of the horses — relatively small, powerful and physically distinct thanks to their isolated lineage. They're sometimes called Banker ponies because of their size. The experts who care for them say the horses have weathered hurricanes before and never died in flooding, so they're being left to get by on instinct and extra hay as most of the humans on the island leave. The horses established themselves long ago — perhaps before Europeans established themselves here. In 1585, Sir Richard Grenville’s ship, Tiger, ran aground on Ocracoke, and there is speculation that he unloaded today's horses' ancestors to lighten his load and re-float his ship, according to the park service. Today's Banker ponies roam freely on a 180-acre pasture that is separated from North Carolina's State Highway 12 by a wooden fence. 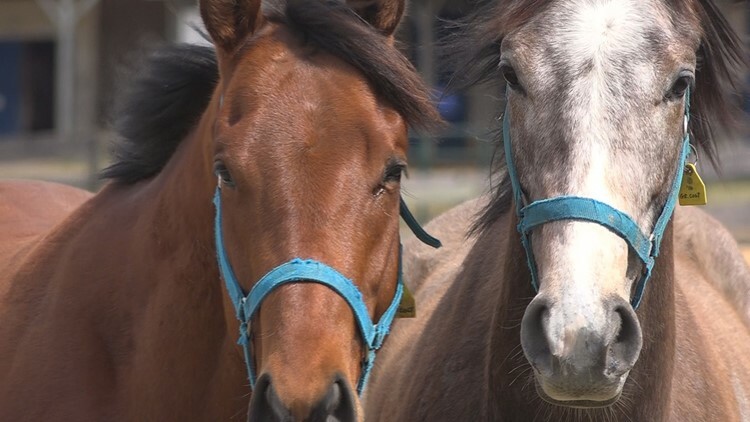 "In all of the years that the island has experience hurricanes, we only know of one time a horse was lost because of a storm, and that horse was hit with flying debris from a barn," said David Hallac, the superintendent of Cape Hatteras National Seashore, who oversees the Ocracoke horses. "We have moved the ponies to the highest point of their pasture, and we're going to give them extra feed. We truly believe they will be OK. They know how to weather a storm. "If we were talking about weeks of not being able to feed them, we would be concerned, of course, but we believe we will be able to check on them not too long after the storm. The horses will be able to survive for a few days even if they eat all of their food or even if some of it blows away." There are additional feral horses along the Outer Banks, including a herd in Currituck County. Those horses are also staying in place to weather the storm. The Corolla Wild Horse Fund addressed the horses' safety in a Facebook post this week. "The horses have lived on this barrier island for 500 years, and they are well equipped to deal with rough weather," the post states. "They know where to go to stay high and dry and are probably in better shape right now than most of us humans who are scrambling with final preparations. They are much better off without any help from us; anything we might do in the hopes of 'protecting' them would probably end up being more dangerous and stressful for them than the storm." Follow Nikie Mayo on Twitter @NikieMayo or email her at nmayo@gannett.com.